[From IMDb:] A serial killer dies, comes back as a snowman, and wreacks havoc. In a similar vein to Child’s Play, Jack Frost is a dark comedy that plays on the concept of a serial killer returning to life as an inanimate object in order to continue their killing spree. 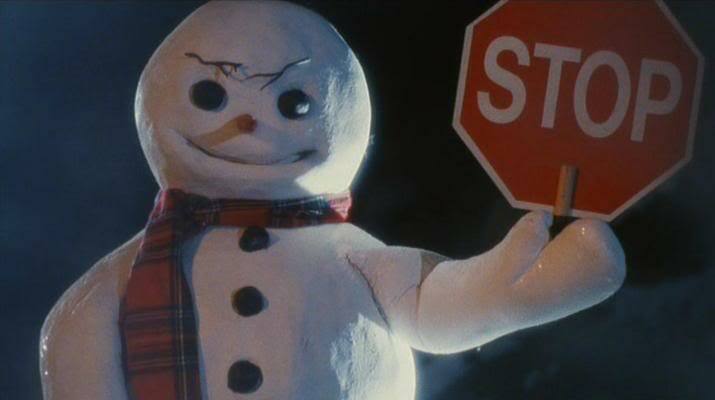 In this case, Jack Frost comes back as a snowman seeking revenge against the sheriff of Snowmonton, a town where everyone seems to be experiencing some type of mental health issue, or showing some kind of criminal tendencies. Seriously: the sheriff seems to have PTSD; there’s a woman walking around town who clearly isn’t all there, probably because she’s been beaten down so thorougly by her seemingly abusive husband; and a couple of teens decide to break into the sheriff’s house for shits and giggles. These people aren’t normal. But, hell, it’s a fun little gem of the horror genre. It doesn’t take itself all that seriously, and revels in the comedy of its premise, inviting the viewer to join in on the laughs. And while the special effects are of, uh, questionable quality, the deaths are at least creative. There’s absolutely nothing scary about this movie, but it’s a hell of a lot of fun. And it has a sequel, which I’m sure will be even better.